The Ultimate Improvement Cycle is based upon the basic principles associated with Lean, Six Sigma, and the Theory of Constraints, but it is unique in that it capitalizes on a time-released formula for use of the key tools, techniques, principles, and actions of all three initiatives focused on the right area. It does not require any more resources than you currently have available, but it does provide the focus needed to achieve maximum resource utilization, which translates into maximum return on investment. Using this method will provide you with a self-funded improvement effort that will sustain itself. The genesis behind the Ultimate Improvement Cycle is based upon many years of analysis of both failures and successes using Lean, Six Sigma, and the Theory of Constraints as stand-alone improvement initiatives. The Theory of Constraints (TOC) reveals interdependencies that exist within your operation and focuses your efforts on the constraining operation. Although TOC provides the necessary focus, Lean works to simplify and free the constraint of unnecessary waste, as well as increasing the throughput of your total system. As Lean is doing this, Six Sigma removes variation and defects, while working to sustain the improvements. The analysis has revealed a common thread between successful initiatives, no matter whether they were based on Lean, Six Sigma, or TOC models. The key to success is the leverage point, or where the improvement efforts were focused. Although eliminating waste (Lean) and reducing variation (Six Sigma) are both critical components of all successful improvement initiatives, where these efforts are focused will determine the ultimate impact on a company’s bottom line. By integrating Lean, Six Sigma, and the Theory of Constraints into a single improvement cycle, the author developed a recipe that will maximize your return on investment, cash flow, and net profit. You will find this book to be both stimulating and thought-provoking, but more importantly, it will provide your organization with a road map for maximizing the use of your resources to achieve more bottom-line improvement than you ever imagined possible. Introduction - In this section of the book my intention is to review the basics of Lean, Six Sigma and the Theory of Constraints as though they were stand-alone initiatives in terms of key tools, principles and methods. I further present a comparison of all three initiatives and explain why this integration works so well. In addition, I present the basics of throughput accounting and why it is so important to successful TOC implementations. 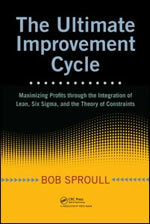 Chapter 1 The Lean, Six Sigma, and Theory of Constraints Improvement Cycles - In this chapter, I go into more detail of each initiative and present each as improvement cycles. I also explain why so many Lean, Six Sigma or Lean Sigma initiatives have failed to live up to their advanced billings for many companies. Chapter 2 Introducing the Ultimate Improvement Cycle - In this Chapter, I present the Ultimate Improvement Cycle in both graphic form as well as detailed descriptions of each step in the UIC. I present a holistic view of what this integrated improvement strategy should deliver and reinforce why it works so well by way of a now classic study using a similar strategy. In Chapters 3 through 13, I deliver to the reader the keys to successfully implementing the UIC by providing step-by-step instructions, the correct order for use of tools and principles, and basic Factory Physics Laws that reinforce why key steps are taken and why the UIC works so well. By integrating Lean, Six Sigma, and the TOC, life becomes much easier on the shop floor.